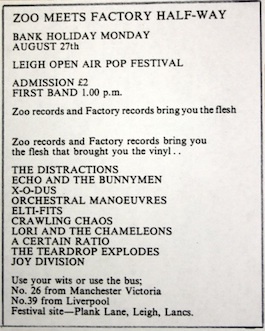 Notes: Event/poster (300 printed) for the Leigh Festival, August 27th 1979, titled 'Zoo Meets Factory Half-Way'. Festival site - Plank Lane, Leigh. 'Zoo Records and Factory Records bring you the flesh that brought you the vinyl'. Features THE DISTRACTIONS, ECHO AND THE BUNNYMEN, X-O-DUS, OMD, ELTI-FITS, CRAWLING CHAOS, LORI AND THE CHAMELEONS, A CERTAIN RATIO, THE TEARDROP EXPLODES, and JOY DIVISION. FAC 15 was originally assigned to a single by ELTI-FITS.